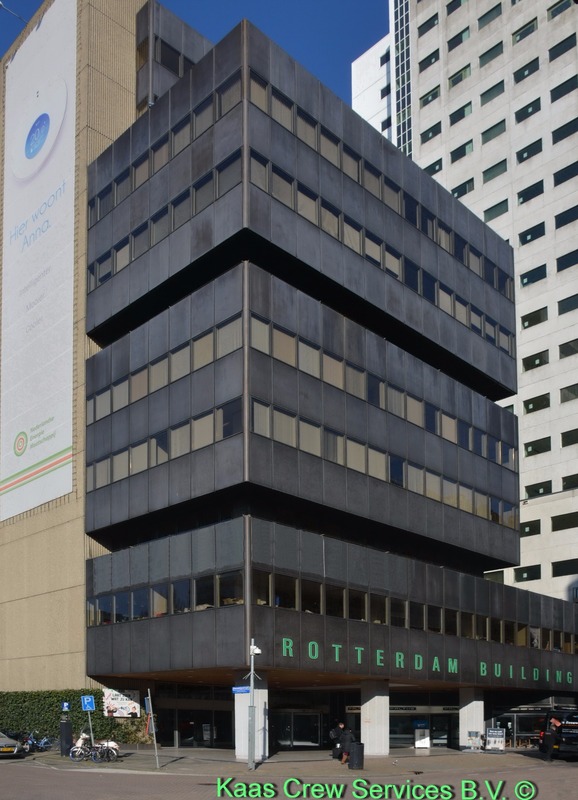 The Rotterdam Building is situated on de corner of the Aert van Nesstraat and the Hennekijnstraat in the middle of the centre of Rotterdam. The Aert van Nessstraat is a side street of the Coolsingel, the main city road of Rotterdam. The complex was built in 1976 and designed by the famous Dutch office architect Kraaijevanger. It numbers a 21,000 m2 space, it has 15 floors and it is 54 meters high. Kaas Crew Services is situated on the 8th floor with a beautiful view over the city centre of Rotterdam. Rotterdam Central Train station is at 5 minutes walking. Airport Rotterdam is 15 minutes by taxi. Airport Schiphol is 30 minutes by train.